The ultimate broad spectrum virucidal disinfectant. Complete disease control for hard surface and aerial disinfection. Powerful disinfectant independently proven effective against all virus families affecting man and animals. Non-tainting and no environmental residue issues associated with use. Potent antibacterial activity, passing AOAC detergent sanitizer test at 1:200 dilution. An excellent and safe water sanitizer, may be used as an aerial spray, unique product suitable for use on all types of farms and in hatcheries, safe and suitable for use with all types of animals and bird, UK MAFF approved at exceptionally high dilutions, Foot & Mouth Disease 1:300 and General Orders 1:120, Swine Vesicular Disease 1:200, Fowl Pest 1:280, Suitable for manual or machine application. 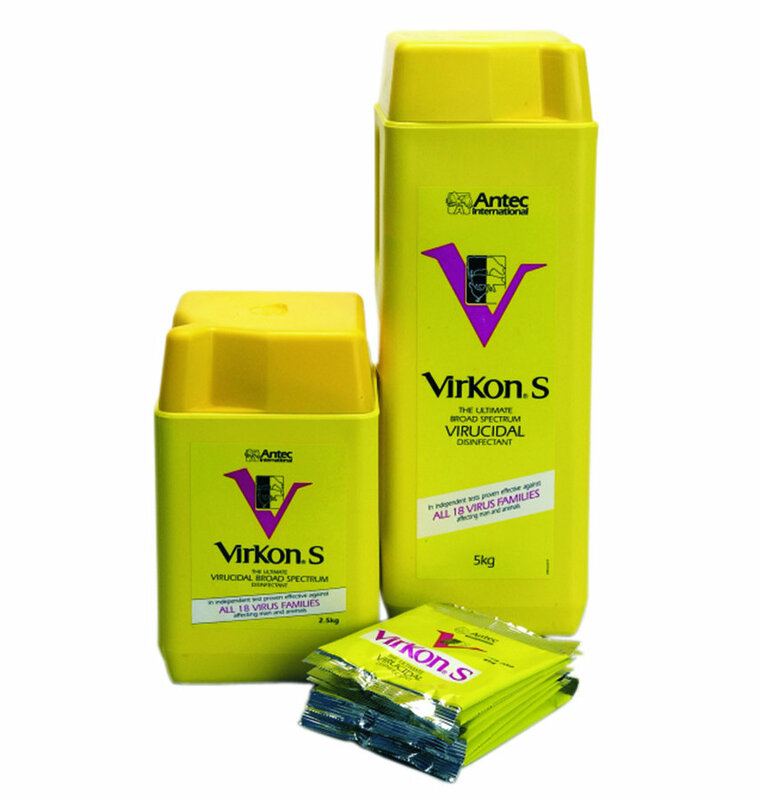 For effective control of viruses, bacteria and fungi. Ideal for stable blocks, horse boxes, tack and equipment cleaning and disinfecting. Powdered or tablet form for convenient storage, transportation and dilution when required. Readily soluble in tepid water, producing a pink solution. A balanced, stabilized blend of peroxygen compounds, surfactant, organic acids and an inorganic acid buffer system. 50g sachets (single sachet makes 5L disinfectant); 10kg (makes 1000L disinfectant) & 5kg (makes 5000L disinfectant). Cleansing and disinfecting equipment: Dilution 1:200 (0.5%). Application rate 300-400 mL/m2. Rinse product contacting surfaces with potable water after use. When prolonged contact with metal surfaces is expected rinse with potable water. Rinse application equipment after use. Cleansing porous surfaces: Dilution 1:100 (1.0%) Application rate 300-400 mL/m2. Proven efficacy against the following pathogens; Reovirus, Equine Arteritis virus, Equine Herpes Virus (EHV1), Equine Herpes Virus (EHV3), Retrovirus, Papova Virus, Adenovirus, Orthomyxovirus, Clostridia spp., Salmonella spp., E.Coli, Streptococcus equi, Klebsiella pneumoniae, Pseudomonas aeruginosa, Dermotopholis congolensis, Trichophyton spp.,Microsporum spp.